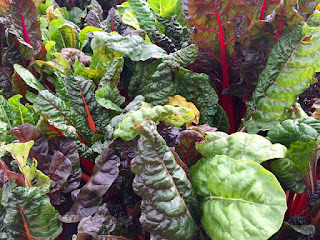 Yet again I am over run with Swiss Chard - Silverbeet in the garden and I've been looking for some new ways to use it up. I have been doing lots of braised chard with chilli and miso, or in curries but was looking for something with a bit more presence on the table or to take to shared meals. I found this recipe in my recipe collection book- the book I hand write in any recipes I come across that I like the look of, this one's been in my book so long I can't accurately remember the source though I think I picked it up when living in the UK. 1.3kg of Silverbeet/Swiss chard- blanched, drained well and roughly chopped. Whisk together cream, eggs and grated cheese. Add salt, pepper and 1/2 tsp ground nutmeg. Pour into oiled pie dish. Bake at 180C in top section of oven for 30-40 minutes or until set. I sometimes make a half quantity which gives me the base of 2-3 meals, depending on my appetite. Makes a great lunch or dinner with a side salad and avocado or tinned sardines and rocket.